VEGAN IN NOTTINGHAM: ROAST DINNER. - CRUELTY-FREE BECKY. VEGAN IN NOTTINGHAM: ROAST DINNER. WHERE? 59 Abbey Street, Old Lenton, Nottingham, NG7 2NZ. WHAT? 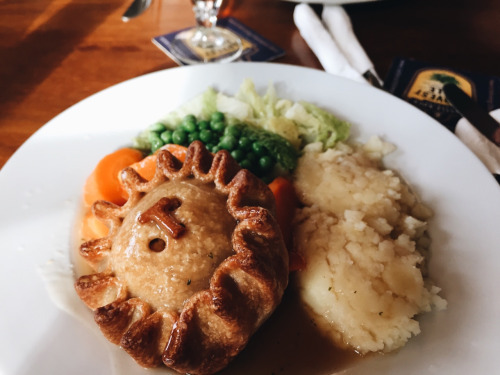 When was the last time you came across an old English pub that offered a multitude of vegan and veggie options as a sunday lunch? I'm pretty sure I've seen a grand total on none in my time as a vegan. Alas, tucked away in Old Lenton town, the Johnston Arms does just that. It offers three different homemade pies void of any dairy or meat to go along with your veggies and gravy. I went for the 'Tamarind' which consisted of sweet potato, red onion, chick peas, turnip, coconut & lime. An odd choice of flavours you might think, but it really worked. My only grumble is that it wasn't as hot as I like my meals (I like it pipin' hot). It also does a couple of vegan cake and ice-cream puddings as well. Winning. Plus, even on a student budget, a price of £7 for a cooked dinner served on your doorstep really isn't bad at all. Especially when you've been living off cereal for the past three days. Ha ha. Ha. Check out their website and online menus here johnsonarms.co.uk.